British guitarists should brace themselves for bad news just announced in London. For a period of many, many years, they will have great difficulty buying any American-brand guitars. The government is having money troubles and has come up with a series of import controls to try to put things right. OK, relax. This did really happen—but it was way back in the ’40s and ‘50s. Just imagine how you’d feel, though. I mean, American guitars. Fenders, Gibsons, Martins, Gretsches, Guilds—all the big names—and none of them available. For years and years. Some have since described this debacle as an import ban that cut through much of the ‘50s. In fact, the scarcity of new American instruments in the UK lasted more or less from the end of World War II until 1959. That focus on the ‘50s is probably down to a new set of restrictions that the British government announced at the end of 1951. "The music profession is among the first to feel the impact of the Conservative Government’s economy drive," said a November ’51 report in Melody Maker, the weekly musicians paper. "The import of musical instruments and records, hitherto unrestricted, is to be drastically curtailed. Initial reports suggest a 75 percent cut may be expected." It turned out that British instrument importers continued mostly to ignore American products. And many of them continued to import some European-made guitars and other gear. All this had a marked effect on what British guitarists were able to play, in addition to any limitations they may have had thanks to budget or ambition. 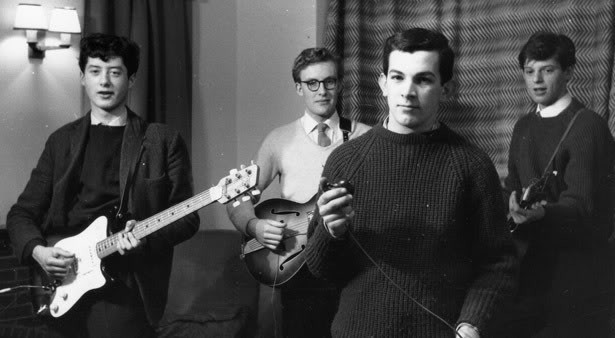 Look at what guitarists were playing in the early beat groups of the ‘50s, whether you were in Liverpool or London or Manchester or Glasgow or anywhere else, and you’d see almost exclusively European brands, plus a few Japanese. Hofner was the most popular of these, made in Germany and including the plentiful Club electrics, as well as bigger-body models like the President and the Committee. One of the first guitars a young David Gilmour owned, for example, was a Hofner Club. He was by no means alone in that choice. Also from Germany came Aristone, Framus, Hoyer, Klira, Otwin, Roger, and others, while from Japan there was Antoria, and Guyatone. 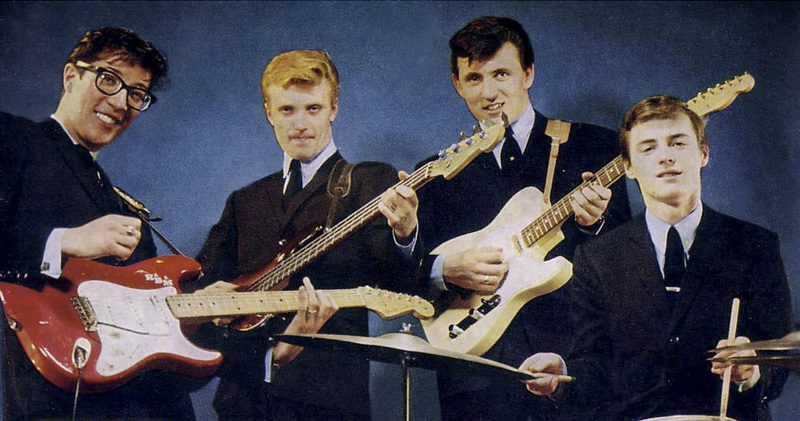 Hank Marvin’s first electric was an Antoria, a guitar that played exactly like the cheaply-made plank it was. Rarities among these ‘50s electrics were Grimshaw guitars—they were actually made in Britain. Sweden saw some action, too, with Hagstrom guitars, Holland with Egmond, and Czechoslovakia (later the Czech Republic) with Futurama electrics, which at least looked a little like the unobtainable Fender Stratocaster. Jimmy Page called his Futurama a Grazioso because, like some examples, his had a "Grazioso" logo on the headstock. 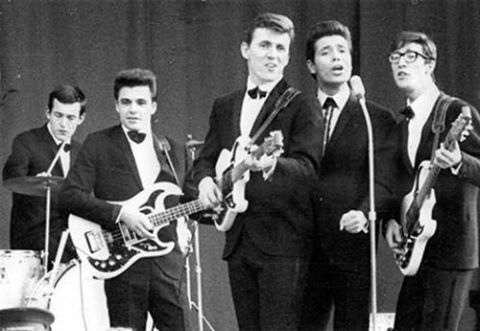 "That’s the first electric guitar I got," Jimmy told me. "The one before it, a Hofner, my dad bought, but after…" he pauses and then laughs out loud. "I don’t know, maybe he was psychic and he knew what was coming. Because there’s a whole procession of guitars that came into my life over the next few years. But that was the first one, the Grazioso. It looked and felt like an electric guitar, even though it wasn’t a Fender." Where did he buy it? "I got that in Bell’s in Surbiton. That shop was where the other guitar came from, too, the Hofner. Accordions and things, they had, but they didn’t have things like Gibsons and Fenders. Who did in those days?" The short answer is: pretty much nobody. Following the end of World War II, the British Board of Trade controlled imports to try to improve the UK’s balance of payments, a politician’s term that means the wealth of the country measured by comparing incoming and outgoing costs. The government’s main objective was to secure what they saw as necessary savings in the UK’s overseas spending, in order to reduce the growing dollar deficit. The broader restrictions of the early ‘50s applied primarily to food and drink imports, but among the restricted manufactured goods were musical items, namely gramophone records, harmonicas and their parts, musical boxes and their movements, stringed instruments (including guitars), wind instruments (not including organs), and some organ parts. During this period, there were still a few ways to get an American guitar. One was to persuade a sailor to bring one back from a trip to the USA. Another was to track down one of the few secondhand instruments that came up for sale. Or you could import a new one privately. That’s what British singer Cliff Richard and his guitarists Hank Marvin and Bruce Welch did. 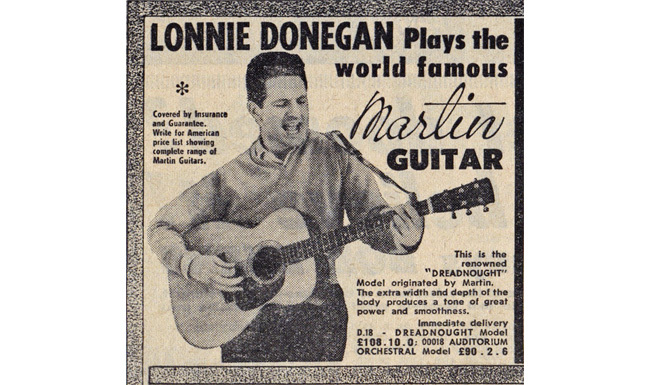 Much of the lure of American guitars for young British players came from the fact that they were, logically, what American guitarists played. And if you loved American rock ’n’ roll and wanted to play that music yourself, it followed that you needed an American guitar. Which is exactly what Cliff, Hank, and Bruce thought (and many others like them). They worked out that their hero, James Burton, played a Fender, and they sent away to the California HQ for a brochure. When the 1958/59 catalogue arrived, they spent a good deal of time drooling over the contents, not least the luscious red Stratocaster with gold-plated hardware and maple neck pictured prominently on the front. Burton himself must surely play this most luxurious Fender, they figured. The generous Cliff wrote back to California to order one. 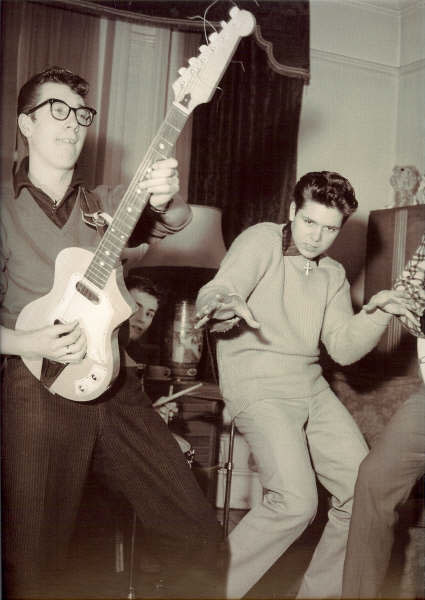 Only later did they discover that Burton was, in fact, a confirmed Telecaster man. No matter. Hank Marvin found himself early in 1959 playing a real American-made red Stratocaster with gold-plated hardware. It was one of the first Strats in the UK, and certainly it became the most visible. There were earlier, unofficial arrivals—some, thanks to an obliging crew on the U.S.–UK liner fleet who could pop into Manny’s store in New York City, for example, and bring back a rare six-string for Brits with the contacts and the cash and the nerve. But it was Hank and The Shadows who displayed this rare American prize to thousands of adoring fans as Cliff and the quartet began their rise to fame. Soon after Hank’s special arrival, the British government at last changed its mind about musical imports, and Melody Maker was there again to report on the moves. 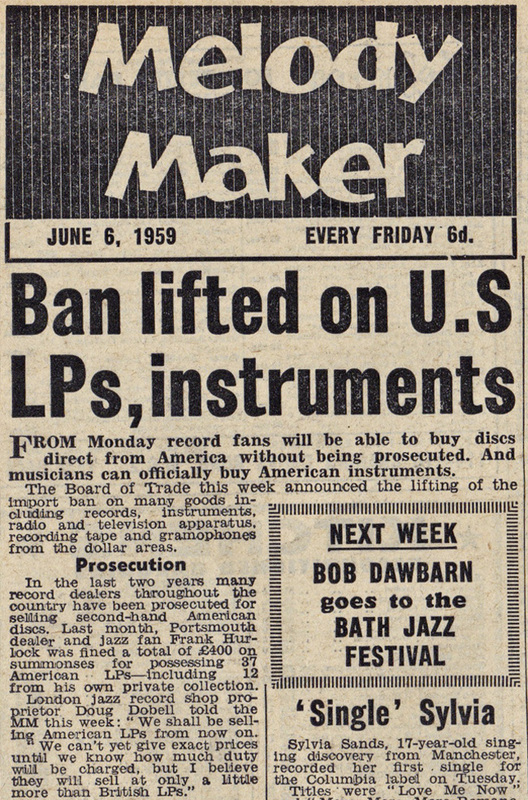 "The Board of Trade this week announced the lifting of the import ban on many goods," ran a news splash in June 1959, "including records, instruments, radio and television apparatus, recording tape and gramophones from the dollar areas." The so-called dollar area included 16 Central and South American countries as well as Canada and the United States, but of course it was the U.S. that was of greatest importance to guitarists. Stanley Lewis and Ivor Mairants in central London were among the first shops to advertise some early newcomers. "USA Guitars in stock now!" Lewis exclaimed in September ’59. 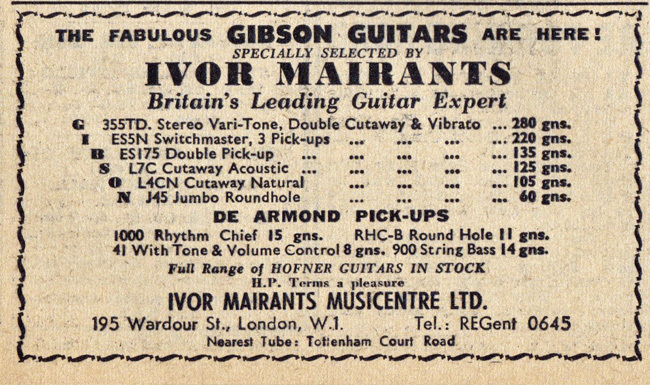 "The Martin rang ... Gibson, Guild, Harmony, etc." Mairants in the same month offered to take orders for soon-to-come Guild, Martin, Harmony, and Epiphone guitars. marking the end of the ban. Britain had been without an official Gibson distributor since Francis Day & Hunter (FD&H) stopped bringing in these American instruments upon the outbreak of World War II. Once the import restrictions were lifted in 1959, the British Selmer company stepped in to become the new Gibson distributor. Boosey & Hawkes announced in August ’59 their imminent UK distribution deals for Guild, Martin, Harmony, and Vega. Similarly, in 1960, Jennings (better known as the manufacturer of Vox gear) picked up the plum job of distributing Fender in the UK, although Selmer, too, added Fender to its imported lines a few years later. Big Jim Sullivan, soon to become a busy session player on the London studio scene, was one of the pro guitarists who jumped at the opportunity to choose a new American guitar for himself almost as soon as the restrictions were lifted. In fact, he was one of the lucky souls who already had one. He’d found fame earlier in the ‘50s with Marty Wilde & His Wildcats. And as with Hank Marvin, he’d been lucky enough to work for a generous singer who found a way around the import problem. Marty Wilde had given Big Jim a Les Paul Goldtop in 1957, which Wilde had bought secondhand from Sister Rosetta Tharpe when she toured the UK at the end of that year. "I used that guitar until 1959, when American guitars were allowed to be imported into this country," Big Jim recalled later. Now, like many, he was lusting after something from among the newly available American guitars. "I then bought a cherry red Gibson 345 stereo from Ivor Mairants. It was magnificent!" About the Author: Tony Bacon writes about musical instruments, musicians, and music. He is a co-founder of Backbeat UK and Jawbone Press. His books include The Ultimate Guitar Book, London Live, and Electric Guitars: Design And Invention. His latest is a new edition of Electric Guitars: The Illustrated Encyclopedia (Chartwell). Tony lives in Bristol, England. More info at tonybacon.co.uk.